Happy 60th Birthday Barbie! As an ‘influencer’ for the past six decades, this icon of the toy world has reflected changes in fashion, adapted to new body shapes, tried out different careers, got herself a boyfriend, and now even has her own Instagram account and YouTube vlog. This latter development is interesting. Barbie – the doll – is clearly not a real person. Yet there she is, vlogging away, offering advice, detailing her life, and offering a commentary on social topics of relevance to girls and young women. Next, she’ll be part of the mukbang phenomenon. The what? Ah, yes mukbang. It’s an online audio-visual experience, during which someone shares videos of themselves eating in real time. They’re often gorging on huge amounts while viewers watch them slurping, tasting and burping their way through their food mountains. On second thoughts, mukbang probably wouldn’t be Barbie’s cup of tea (or plate of food). She’d be too worried about spilling sauce down the front of her immaculate clothes. But the point of all of this is that Barbie vlogging and ordinary people mukbanging (if that’s the correct phrase) is indicative of a new generational era – that of the synthetic generation. Described in depth in Sogeti’s new report ‘The Synthetic Generation – Growing up in an uncertain world’, this generation is the first to be wholly digital: post-millennial youngsters for whom the concept of digital ‘transformation’ is alien. And being an influencer can be highly lucrative. We recently heard that, at just 21 years of age, Kylie Jenner became the youngest billionaire ever. Kylie who? Ask the nearest Gen-Z youngster (one of several names given to the synthetic generation). They’ll tell you she’s a social media star (and member of the media obsessed Kardashian family) who’s built a beauty empire and global brand off the back of her massive Instagram following. Who knows, perhaps we’ll see Barbie launching her own cosmetic label in the coming months and promoting it via vlogs and on Instagram. Will that label be any less ‘real’ than that of Kylie Jenner’s? Balancing what’s fake and what’s fact. Living in a social media world. Influencing and being influenced. Gen-Z youngsters are building something new; something that feels authentic to them, whether it’s ‘real’ or ‘fake’. 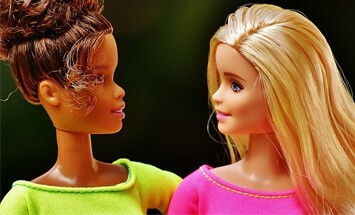 And while Barbie may not be a real human being, she’s played her part as an authentic influencer for 60 years. ‘The Synthetic Generation’ is the third report in Sogeti’s Digital Happiness series. Download the report. Sander Duivestein (1971) is a highly acclaimed and top-rated trendwatcher, an influential author, an acclaimed keynote speaker, a digital business entrepreneur, and a strategic advisor on disruptive innovations. His main focus is the impact of new technologies on people, businesses and society.